Website in the recent time has become the savior for both the service provider and the service seeker as it saves both of their time and energy. WordPress has been helping us in creating stunning websites for any and every niche. No wonder, it offers a wealth of themes for all kinds of website. But you might be wondering, is there any WordPress Construction theme available? 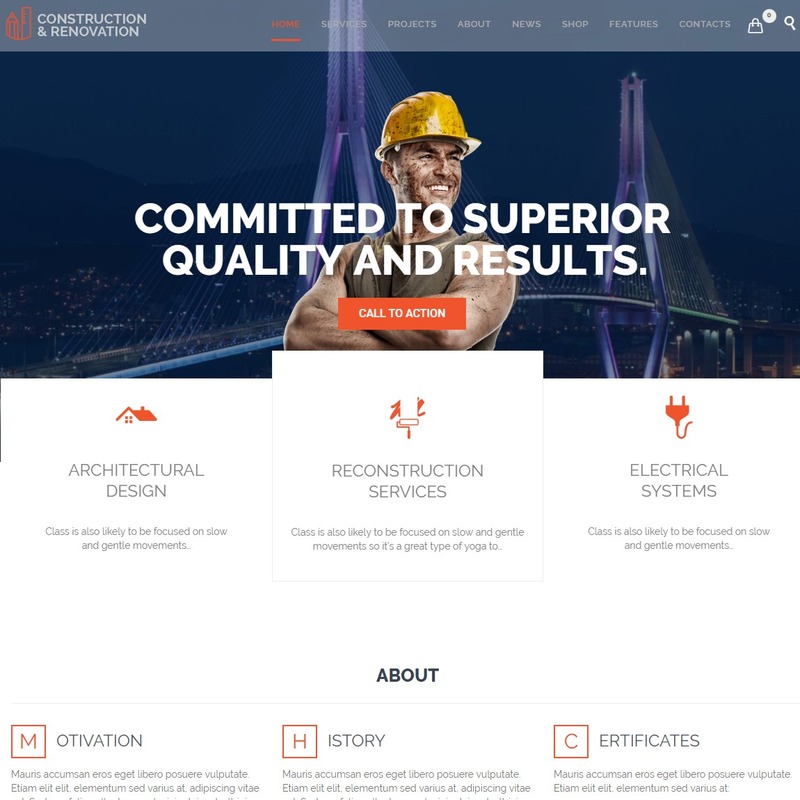 Yes, there are hundreds of construction website templates available on the market. All these times, construction has been all about design and creativity. And your website portrays your creativity to a greater extent. Thus, it is very important that you opt for a right theme while creating a website, especially for construction-related businesses. But, it is not just about how alluring or creative your website looks. Your hard work can be said to have paid off only when your website, in turn, attracts more clients. After all, gaining more clients to our business through our website is what we want ultimately, right? However, choosing the right one can be quite hectic for you all. Thus, I have listed down 10+ Best WordPress Construction themes. Having said that, let’s have a look at the full-fledged best construction website templates. If you want a fantastic WordPress construction theme for your website, Zakra Construction can be the best companion for you. It is a free WordPress theme that has amazing demos in which you also get a demo website made specifically for a construction website. 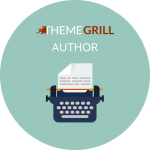 It can be easily downloaded with the ThemeGrill Demo Importer. This can save a lot of your time as you don’t have to start from scratch. You also get a well-categorized homepage with this theme. The different homepage sections are given in the home submenu of the header menu. You can easily jump to specific sections of the homepage from the header menu itself with very smooth navigation. This feature can give your website visitors quite an awesome user-friendly experience as well. 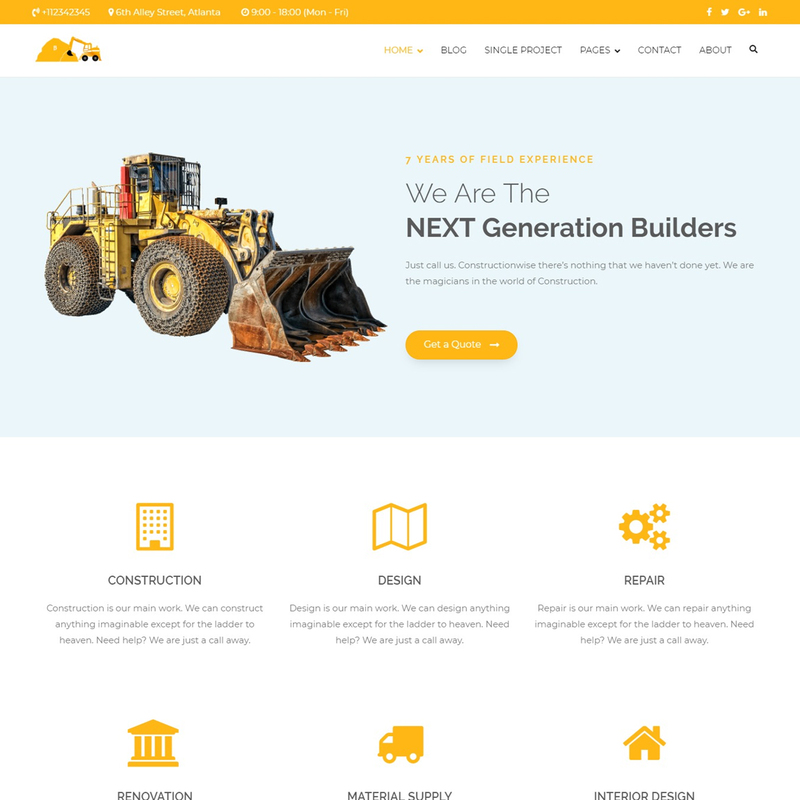 Construction is a WordPress theme that is specifically designed for the companies that offer building and construction services. This beautiful WordPress construction theme is greatly designed and is power-packed with extra-ordinary features. Construction offers you with endless layout possibilities as it comes with over 10 header layouts and more than 20 footer layouts. Furthermore, this theme is designed following best coding practices and with minimal graphics and load-time. Thus, it has unbelievable page-load speed. In addition, it provides a bundle of custom shortcodes which will help you to easily add buttons, icons, lightbox and more. Flash is one of the most popular multipurpose WordPress themes at WordPress.org which currently empowers over 10,000 sites alone. 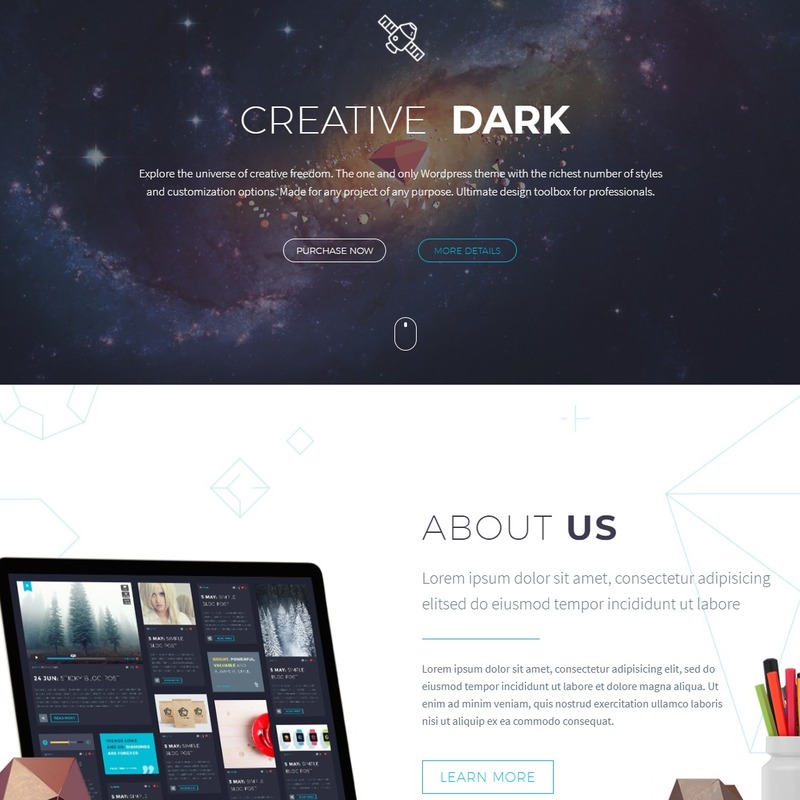 This versatile theme is suitable for any kind of websites. Construction is one of the areas where this feature-rich theme can do wonders. Besides, one of the notable features of Flash is its perfect integration with the Flash Toolkit and the Site Origin’s Page builder plugin. Moreover, the ThemeGrill Demo importer plugin makes it easier to import the pre-built demos the theme provides. Furthermore, it offers over 800 Google fonts and advanced color options to choose from. Flash also has over 6 widget areas and more than 18 custom widgets. TheGem is fully responsive, versatile and an exceptional WordPress Construction theme to develop an amazing website for your building services. It has an amazing homage along with flexible options as well as solid tools in the backend. This theme features over 40 outstanding multi-purpose design concept and an overwhelming amount of stunning homepages. Moreover, it has unlimited page layouts, color as well as font options and more than 60 elements in over 250 styles at your disposal. Thus, you have the full control over the appearance or your website. And if you find anything confusing then it also has meticulously-scripted video tutorials. Suffice, like its name, is adequate for fulfilling the needs corporate, agencies or any kind of websites. It is multipurpose, highly customizable WordPress theme that makes creating a website hassle-free. Moreover, this theme features 7 widget areas and more than 16 custom widgets. In addition, it is WooCommerce and WPML compatible. Suffice comes with custom widget area builder that allows you to build custom sets of widget areas.Furthermore, it has been developed using the latest theme development practices. Thus, it is optimized for speed and keeps the site’s loading time to minimum. 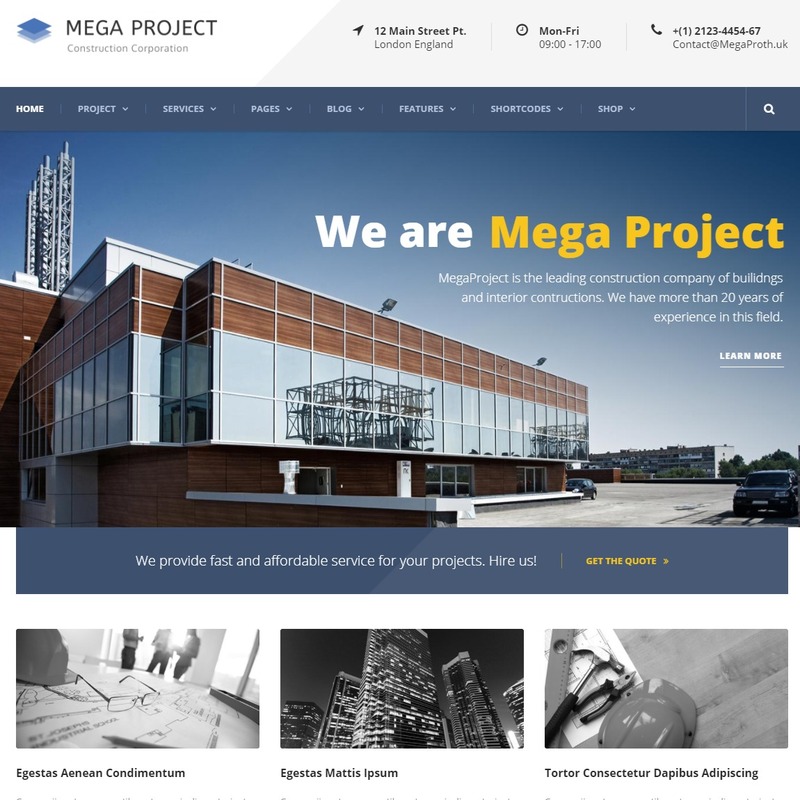 Mega Project is one of the best construction website templates on the market. It comes loaded with all such features and elements that are required for a construction website. Thus, it is one of the options on this list that fully caters to the construction industry. This theme comes with a built-in Mega Menu and has Master Slider included in it. Moreover, it gives you unlimited color options along with 4 header styles, 4 blog styles and 5 project styles. Besides, the size of the sidebars can also be customized. It provides you with the 5 option for the sidebar size- 16%, 25%, 33%, 41%, and 50%. Furthermore, Mega Project is a fully responsive theme that includes responsive elements. Thus, with this theme, you can have your site up and running in few minutes that looks good on all devices. 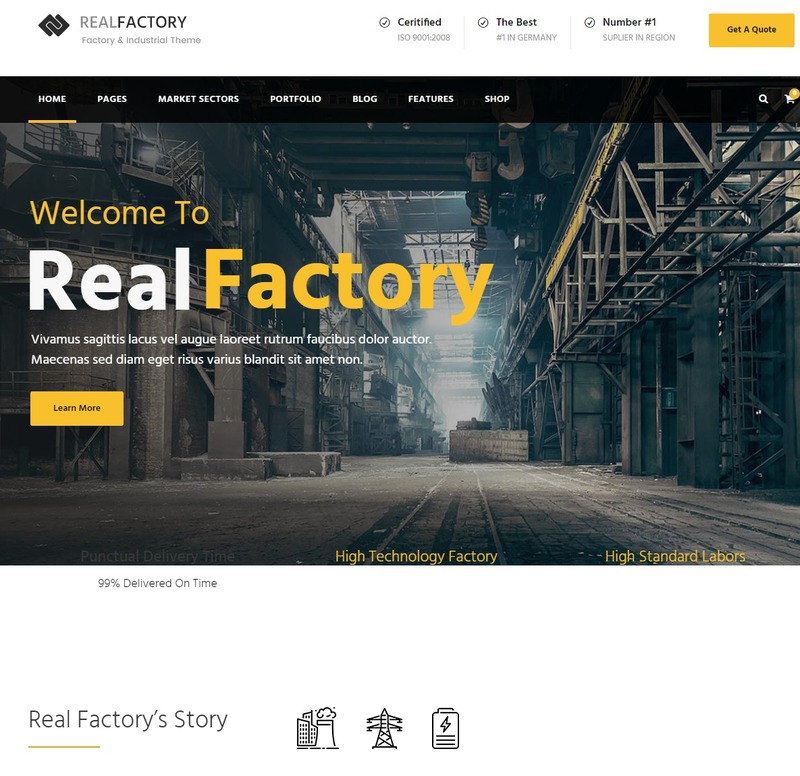 Real factory is a responsive and perfect WordPress Construction theme. Like the name suggests, it is most suitable for the factory and industrial websites. However, this theme can cater to other various types of businesses as well. With the inclusion of the top-notch WordPress plugins, this theme makes it super easy to customize or build your website in no time. Additionally, it features an alluring set of header styles where you can include a slider that showcases your services. Besides, it comes with a powerful and customizable admin panel. It is also fully compatible with WooCommerce and WPML and is search engine optimized. 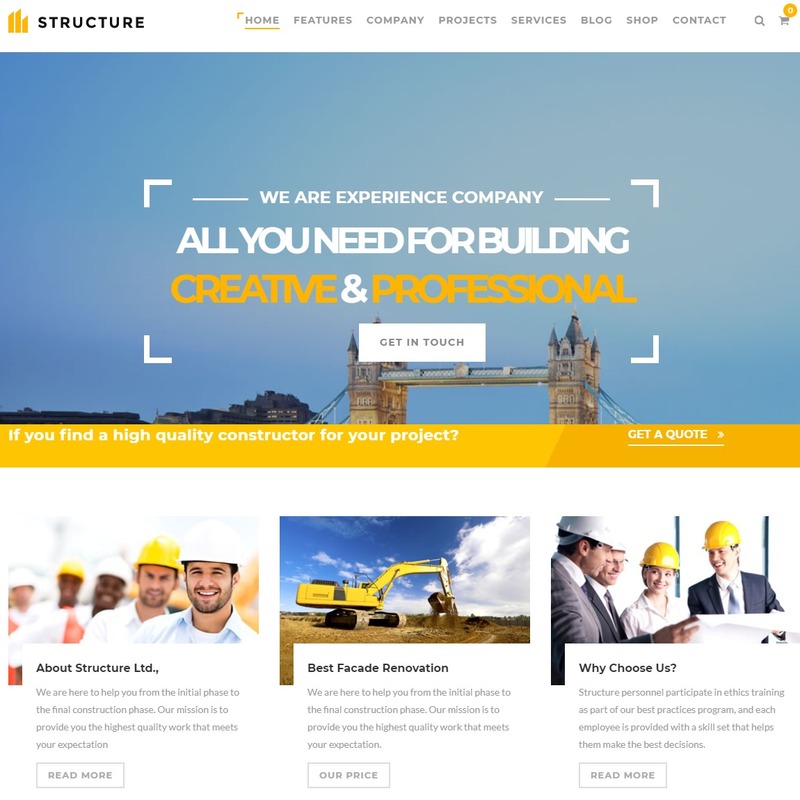 Structure is a construction WordPress theme that allows you create a stunning online presence for your building service companies. Consequently, it helps you to attract more clients to your services. The most notable feature of this WordPress Construction theme is the number of pre-built layouts that comes along. It offers you 15 amazing homepages and two blog options: modern and classic blog layout. Moreover, it provides more than 6 header options and 16 predefined color schemes. Besides, it has the live customizer option you can check out the changes made on your website in the real time. Another on the list is BuildPress. 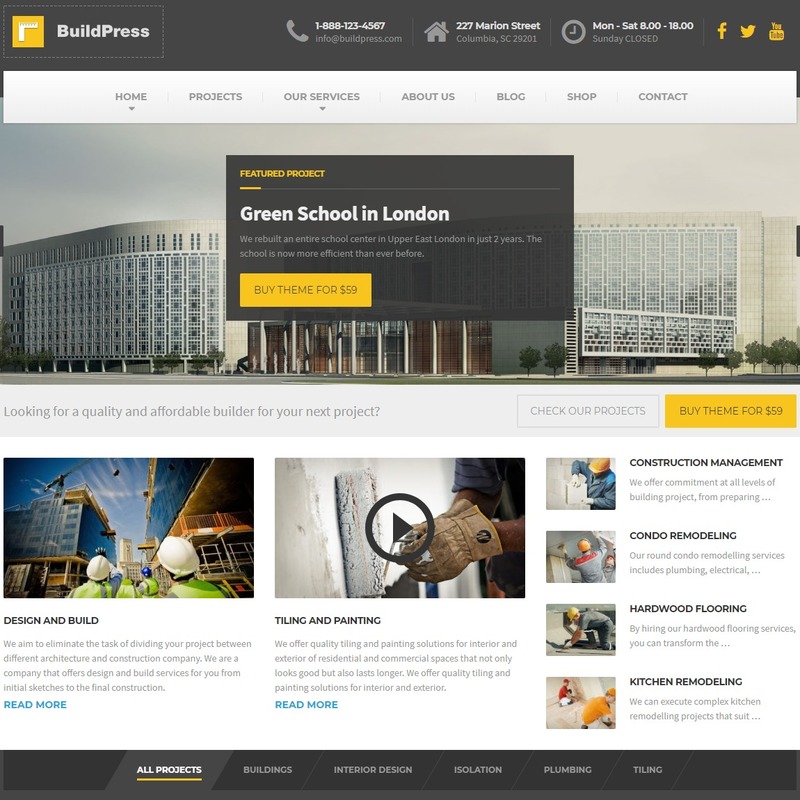 BuildPress is a clean and responsive construction WordPress theme. It is ideal for creating websites for all kinds of building or construction related business. Beyond that, this WordPress construction theme offers customizable header and title area layouts. However, you aren’t limited to the prebuilt demos and layouts. Instead, it provides you ample of personalization options to design your website as per your wish. In addition, it also features one-click demo content import and an advanced admin panel. Customers are also given the access to the themes library of video, support documentation, and screencasts. 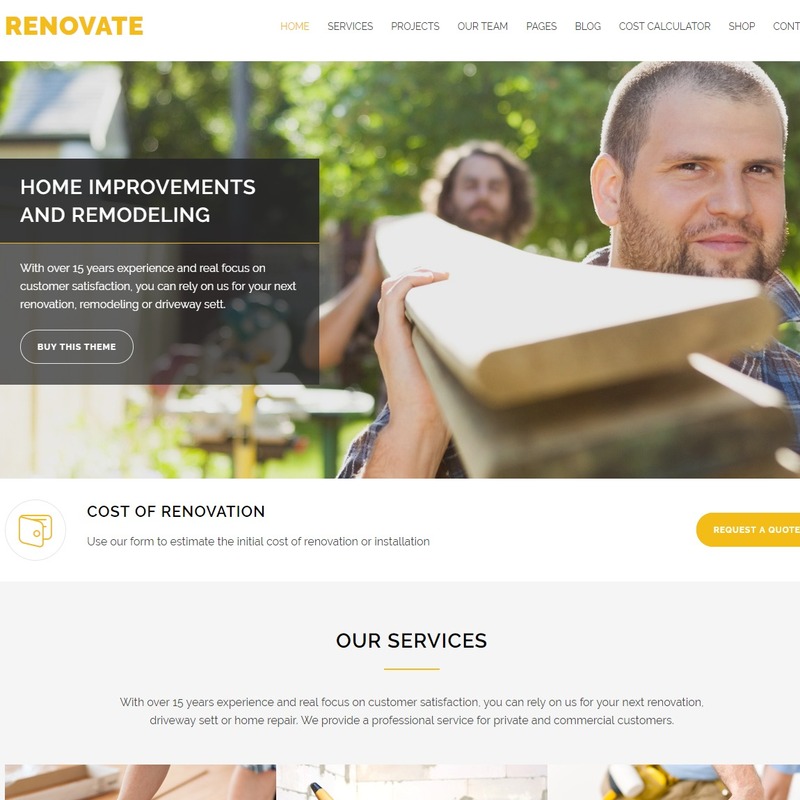 Renovate is yet another responsive and retina-ready WordPress construction theme on our list. This theme is suitable for all kinds of construction, remodeling or renovation businesses. One of the best features in this theme is that it comes with a Cost Calculator tool. This tool helps to easily calculate the cost estimates for all sort of construction services like installation, repair, home maintenance or renovation. Moreover, it includes the best and the most popular WordPress plugins of all times like Slider revolution and Visual Composer. In addition, it comes with the color picker which allows you to change the entire color scheme in just one simple click. 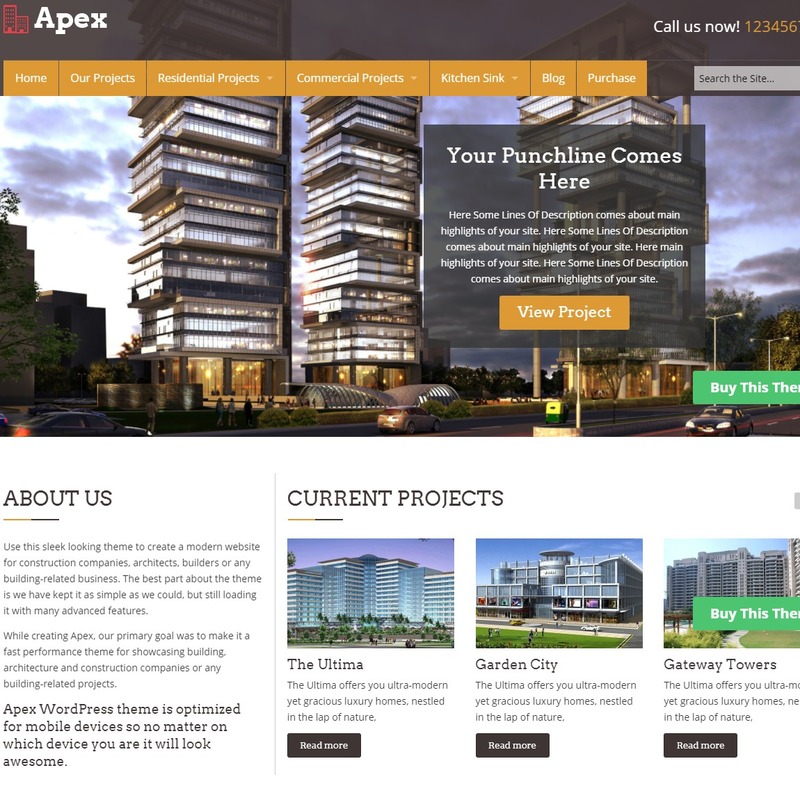 Apex is a responsive, versatile construction theme by Templatic which is ideal for any building or construction related services. This theme is powered by a responsive front-end framework –Foundation. Furthermore, it has the property post type and comprehensive property pages. Hence, you can beautifully showcase your projects with this construction WordPress theme. Moreover, it is compatible with many popular as well as essential WordPress themes like WP Total Cache, WooCommerce, Contact Form 7 and much more. Additionally, you can very conveniently get the sample contents and settings options populated on your site with the one-click sample data import feature. 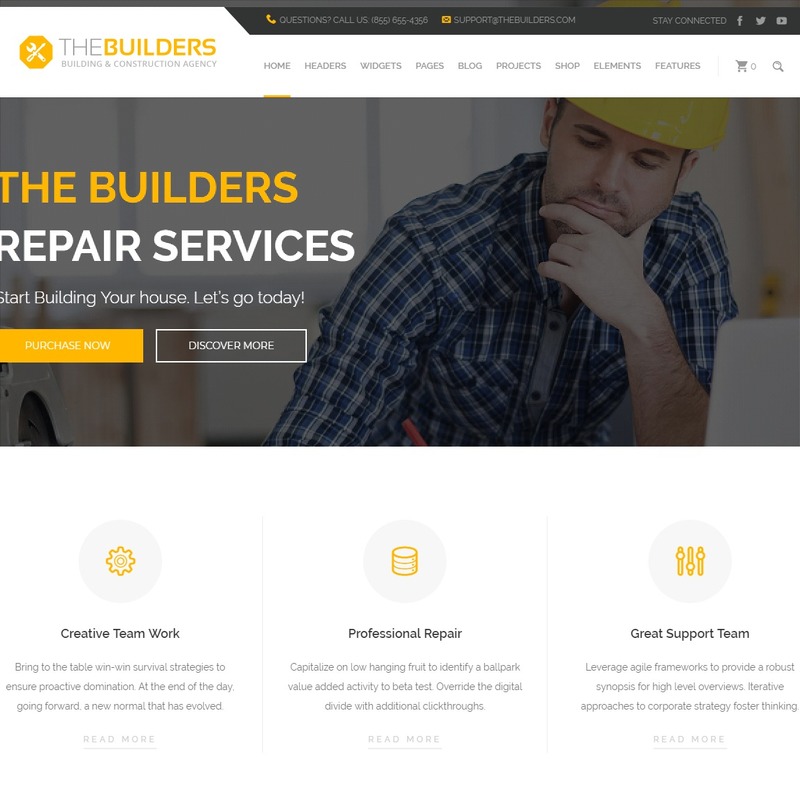 The Builders is a fully responsive, ultra-flexible, clean WordPress construction theme. This theme comes loaded with all such features required for creating an outstanding website for Construction Company, freelance architects, architectural firms and for companies with the similar purpose. It gives you infinite color and font options along with unlimited header versions. Moreover, it has multiple demos with ready demo data included. Also, this construction WordPress theme is child theme compatible. Furthermore, being search engine optimized and the availability of breadcrumbs makes this theme a strong search engine performer. 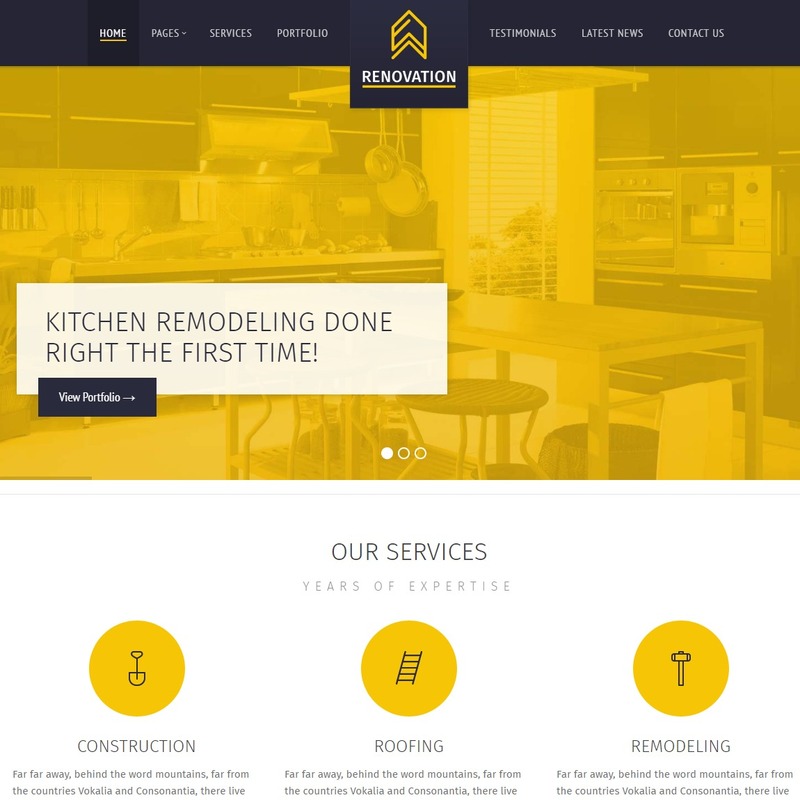 Like its name, Renovation is construction WordPress theme that is fully responsive and retina ready. As the name suggests, Renovation is ideal for companies providing home maintenance and repair services. This theme has all the elements and features at your disposal that helps you to reach out to your potential clients with ease. One of the new, as well as notable features of this theme, is the Cost Calculator tool. This tool allows you to estimate the cost of the remodeling project. Moreover, it offers 7 unique homepages and unlimited color options. In addition, Renovation includes over 600 Google fonts and font awesome icons. Since it includes the Visual Composer plugin, you can easily create various pages using the drag and drop option. 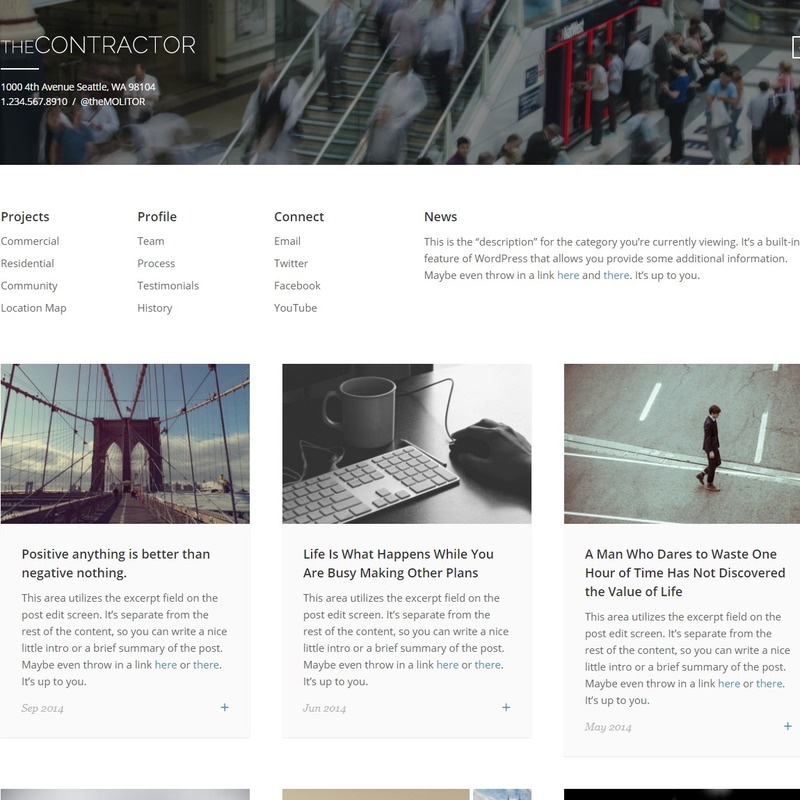 The Contractor is a beautifully designed and feature-rich WordPress construction theme. This theme is specifically crafted for the constuction companies and architecture firms. It features parallax header background effect option along with AJAX post pagination. Moreover, it includes advanced jQuery animations and effects. And all thanx to the support for mobile devices and retina displays that makes the website look best on all devices. On top of that, the theme includes Location map that automatically displays all projects on Google Map. Next, on the list we have is Jevelin. 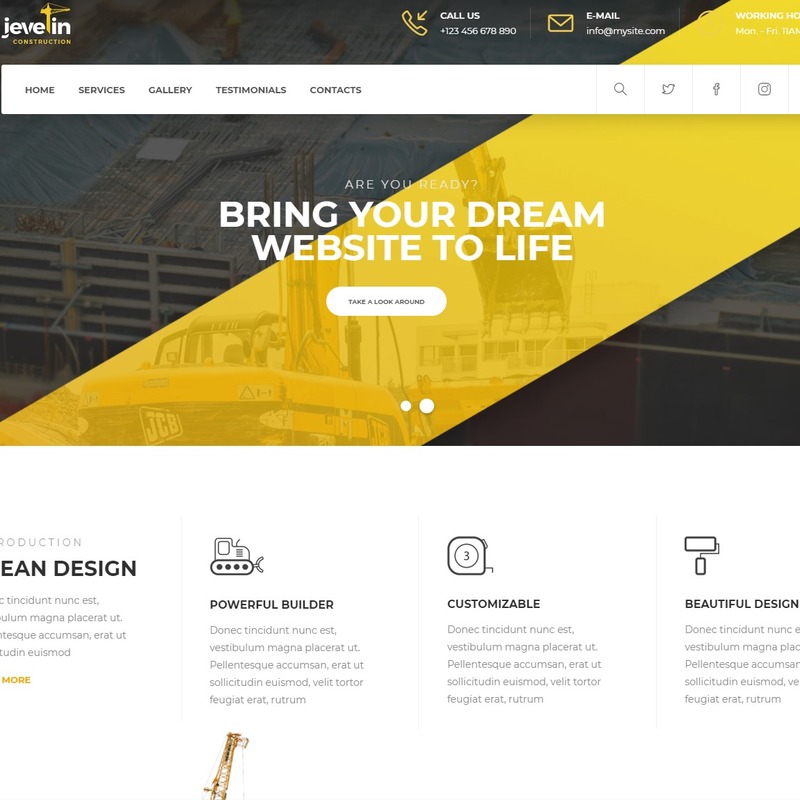 Jevelin is a multipurpose premium responsive WordPress theme. This theme can be used for freelancing purpose, business or private use. Furthermore, it offers a wealth of customization options and a library of professional website demos. Addition of the element editor makes editing contents easier than ever before. Moreover, this highly customizable theme also has 40+ custom crafted shortcodes to offer. Besides that, you can use the powerful theme options control panel to its fullest to tweak and customize the pages and create a stunning website. 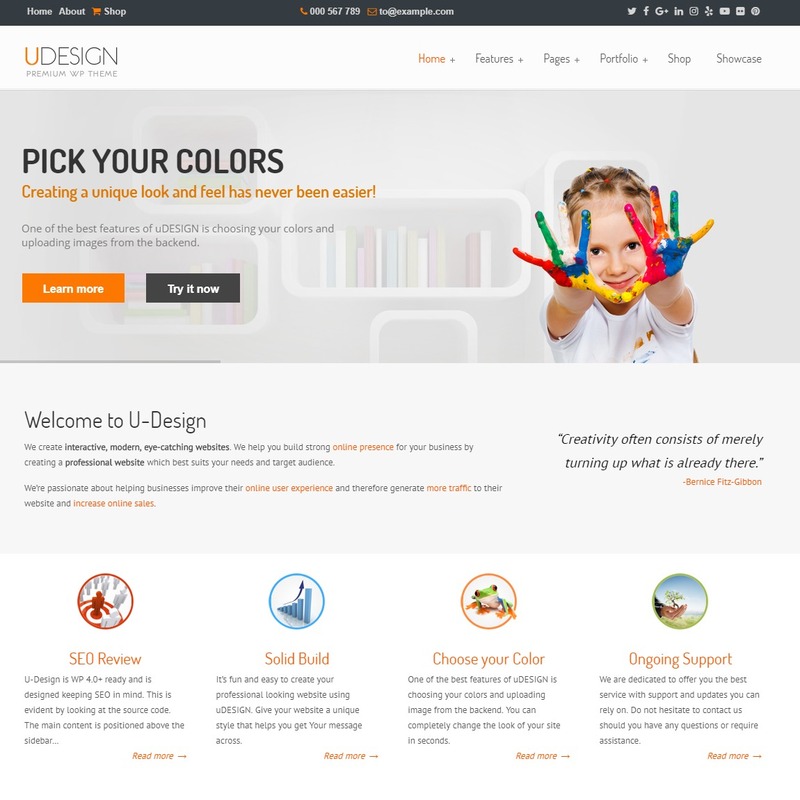 U-Design happens to be the top seller WordPress theme on ThemeForest. This multipurpose, user-friendly theme allows you to create a personalized WordPress site in minutes. Moreover, it is translation and multilingual ready. Furthermore, it has 7 homepage sliders including Flashmo Grid Slider and piecemaker Flash. Additionally, it is crafted with best SEO practices and is compatible with popular WordPress SEO plugins. Best of all, UDesign is always up to date. 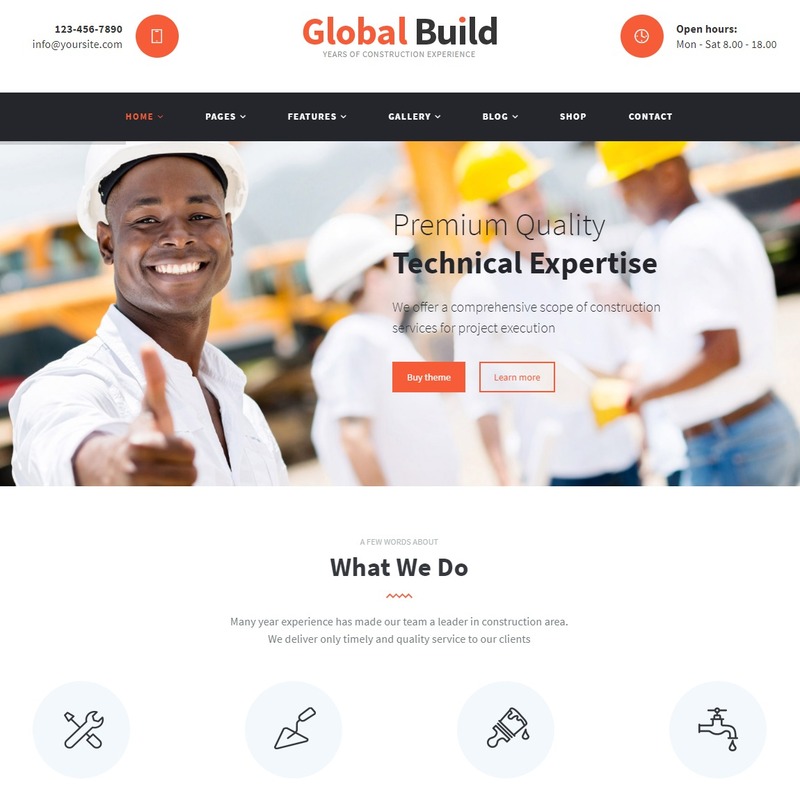 Global Build is a WordPress construction theme that is ideal for creating construction websites or renovation sites. This theme is super flexible which is built with HTML5 and CSS3. Moreover, it integrates Cost Calculator and the Quote Request Form. Also, it provides a set of shortcodes along with the custom widgets which makes it easier to manage the layouts and content of the site. Furthermore, it offers plenty of gallery layouts to showcase your construction projects. In addition, it offers 2 footer styles and 3 Blog styles. the comprehensive admin panel makes it a breeze to customize it. 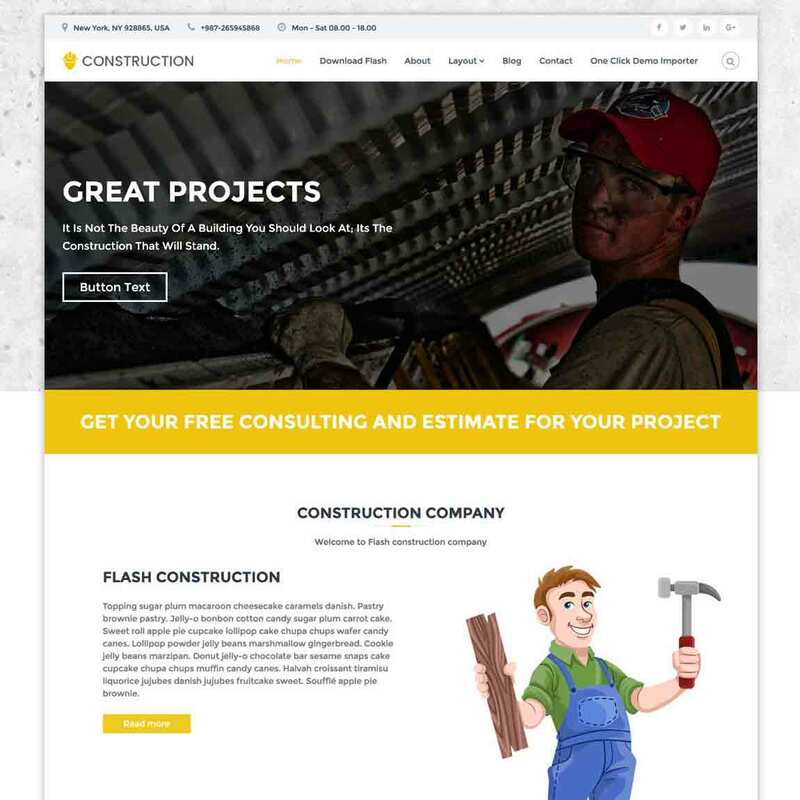 To wrap up, all these construction WordPress templates are so beautifully designed and power-packed with all the features and elements necessary to make your construction website standout from your potential competition. Moreover, they are best in their niche to showcase your services and provide the potential clients with all the information they are looking for. ← Wix Vs Weebly Vs Squarespace Vs GoDaddy Website Builder Vs Jimdo Vs WordPress: Which is the Best Website Builder in 2019? Your choice is nice and awesome. 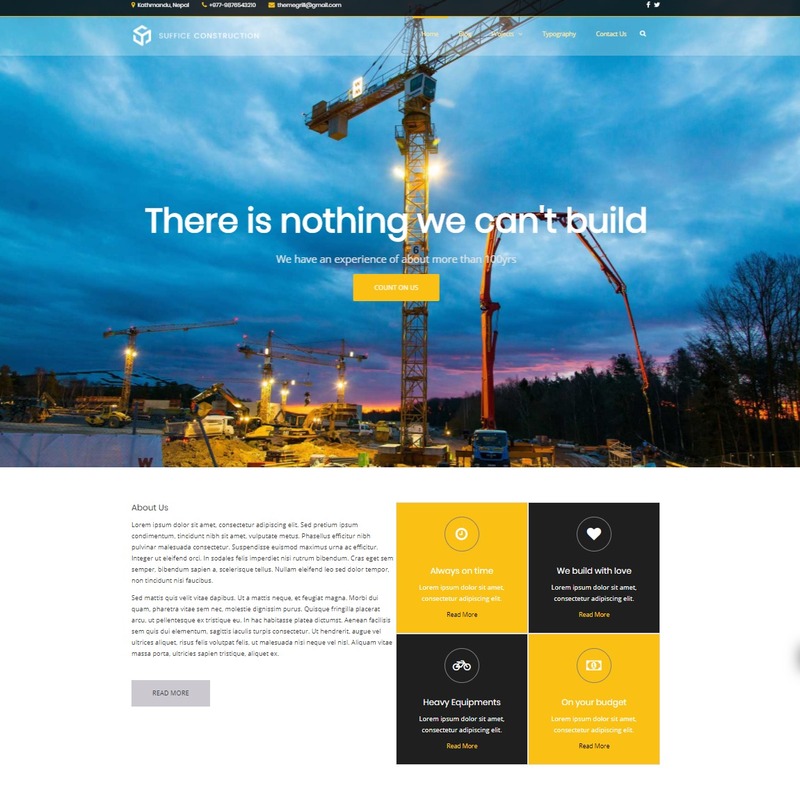 Construction themes are very important for any building website.Thanks for sharing this collection.